Way back in 2010, I had remarked that “battery life is a major issue with all Android phones”. This was written in the days of FroYo (my handset was stil on Eclair). Since then, we have seen a host of Android version updates with better battery management, improved chipsets with ingenious power saving techniques, and of course more powerful batteries. Unfortunately, in spite of all of these advances, the root problem remains. A smartphone’s battery life is no where near what one would consider ideal. The tips I shared in my original article still hold true, and can be followed to extract some additional juice out of out battery. However, today, I will share two brilliant apps whose combined power can easily prolong your Android phone’s battery life by several hours. Using these apps I succeeded in boosting my battery life from 10.5 hours to 14 hours with moderate usage and 3G data. In my older article I recommended an app called “Spare Parts” to monitor battery usage and identify misbehaving apps. Unfortunately, if you are using Gingerbread or a newer variant of Android, Spare Parts can no longer be used on your system. Noticing this void, XDA member ‘chamonix’ stepped up to the plate, and developed his own app called Better Battery Stats. BBS shows an detailed log of your battery usage that can be helpful in identifying resource hogs. The most crucial bit that you should monitor carefully is the ‘Kernel Wakelock’ section. A kernel wakelock often occurs due to buggy apps, and it prevents your phone from entering sleeping state. 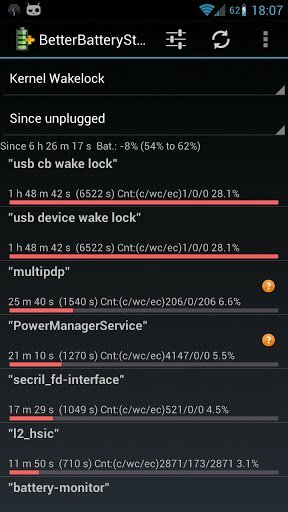 While wakelocks are commonly employed by apps to sync data in the background, constant wakelocks can be a massive drain on the battery. Better Battery Stats is a paid app in the Play Store, but can be downloaded for free from the XDA forums. P.S. If you find BBS to be too confusing, you can use Battery Stats Plus, which offers less detailed metrics, but automatically highlights misbehaving apps. One of the best ways to prolong your battery life is to disable data transfer. A slightly more moderate option is to disable automatic sync. A bunch of apps trying to pull data every few minutes, can drain your battery in a matter of hours. However, disabling either data or automatic sync defeats the purpose of buying a smartphone. 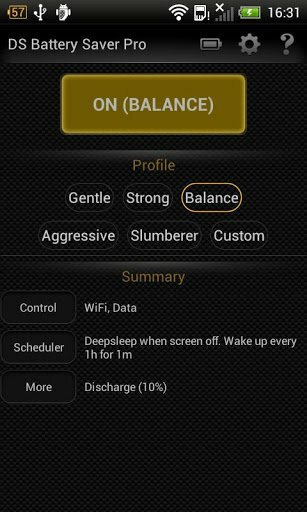 Deep Sleep Battery Saver offers a workable compromise, while massively boosting your battery life. DS Battery Saver automatically disables background data and Wi-Fi, pauses all apps, and puts your phone to deep sleep when the screen is off. However, it periodically re-enables your data and Wi-Fi connections and wakes up apps to allow them to sync. The free version comes with five different presets and offers some degree of customizability. The Pro version however allows you to completely create your own profile with day and night settings, define apps to ignore and more. For most users, the free version should suffice. I have been using this app for past few months, and it boosts my battery life by 25% even on the gentle settings. I can not recommend this app enough. In my book, this is the best Android battery saver app. It’s simple and idiot proof, and works exceedingly well. Just two taps and you are good to go. However, if you want more bells and whistles and settings to play with, you might want to take a look at 2x Battery. I haven’t tested it, but the reviews seem quite positive. This file (batterystats.bin – the system file that battery calibration apps cleanup) is used to maintain, across reboots, low-level data about the kinds of operations the device and your apps are doing between battery changes. That is, it is solely used to compute the blame for battery usage shown in the “Battery Use” UI in settings. Great list for saving some battery energy on my Android. My battery is quite weak, only last a few hours so i will give this a try!